Bio Clean, Inc. is comprised of a team of phenomenal professionals who are dedicated to offering services that are of the highest professional standard, caring, and compassionate. We are located in northwestern Washington. The Pacific Northwest is our home, and we are proud to serve Seattle and the surrounding areas. BCI is a local, family, women owned and operated business and proud members of our community. If you need services outside of Washington state, let us know and we will reach out to our network of reputable contractors if we’re not able to meet your needs. If there is only one thing people remember about Bio Clean, Inc. it is that we care. We aren’t doing this for the money, but because we care about people and the experiences they have in life. Please feel free to reach out to us with any questions or concerns you may have. 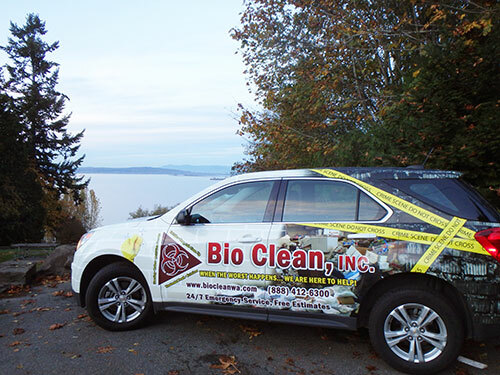 You can reach us at (888) 412-6300 or support@biocleanwa.com. Or you can fill out the form below, and someone will contact you as soon as possible. I'm in need of your services. I would like to apply for employment at Bio Clean. Do you have a question? The answer might be below. If not, call us to speak to one of our knowledgeable staff members. Q: How do you clean it up? Every cleanup is different. We always start with a thorough assessment before we offer an estimate or our recommendations. But once we begin cleaning, we start by removing the source of decontamination, then we clean, deodorize, and disinfect. Each and every situation is unique. We are also cost-conscious, making sure that we charge no more than what we know will be needed to complete the job. We offer free estimates with no strings attached so that you can assess the affordability for yourself. Q: Can I have anyone do what Bio Clean does? No. Federal regulation 29CFR1910.1030 states that no person can be placed in a position to be exposed to blood spills without receiving proper BBP (Blood Borne Pathogen) training, a BBP exposure control plan with PPE’s (Person Protective Equipment). These individuals must also be vaccinated against Hepatitis B, and an exposure evaluation and follow-up is also required. There are other requirements within Washington State that require a license. And any contractor who steps foot on someone else’s property must be bonded and insured to remove liability of their work from the property owner. We are always looking for outgoing, phenomenal people that are looking for a career that allows them to help people and make an impact. We help those that are in an extreme time of need. If you are or know of someone who is interested, we would be happy to speak with you. Bio Clean is always growing, and we can’t grow without a fantastic team who is eager to serve people. If your question wasn’t above, please contact us. We look forward to hearing from you.